Beware the Warner Brothers film that bounds and bounces over history as jauntily as Errol Flynn buckled his swash. 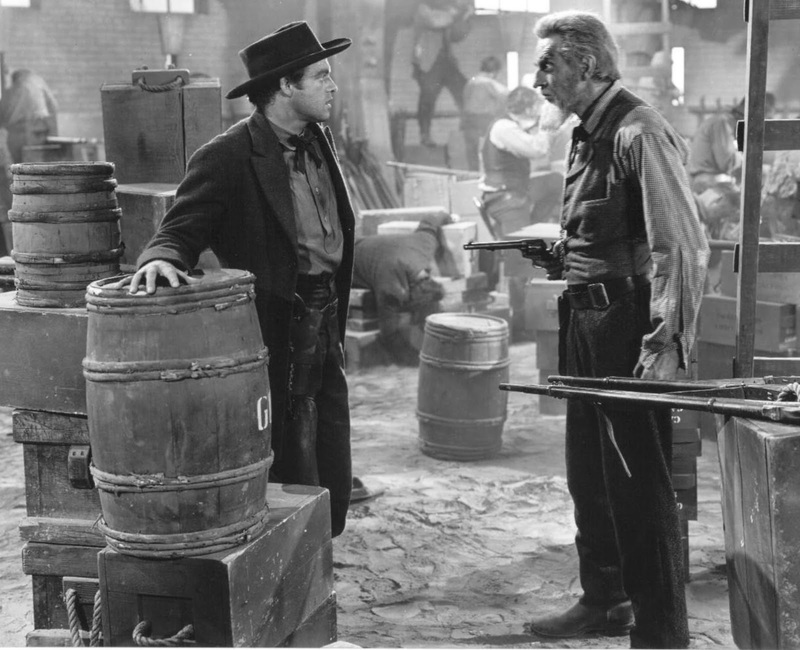 The 1940 horse opera ‘Santa Fe Trail’, directed by Michael Curtiz, is by no means a great film. In fact, I think it’s rather bad. But it should be seen if only to remind you that when tackling the past, Hollywood could sometimes be far off the mark. In 1854 Kansas is a territory divided by the slavery debate, and the abolitionists are the bad guys. Their leader John Brown (Raymond Massey) is written and played as a rabidly religious zealot, answering to no authority except God. He’ll bring about a civil war if he has to (“To hell with the Union!”) He quotes scripture as he moves through Kansas freeing slaves. He and his cronies ruthlessly terrorise the locals and kill slavers. Thankfully the US cavalry is there to save the day. Most of the soldiers and their hangers-on are hicks and care little for politics. There’s lots of talk along the lines of “I don’t know nothin’ about no slavery, and t’ain’t my problem nohow, shucks, it’s fer others to decide.” The two leads are fresh West Pointers, Jeb Stuart (Errol Flynn, debonair as always) and George Custer (Ronald Reagan, stodgy and looking confused), and they’re only in Kansas because they broke the cardinal rule of American soldiery, “the traffic and violent exchange of political ideas.” Their former classmate is an abolitionist, Rader (Van Heflin, very good) and he was kicked out of West Point for preaching anti-slavery rhetoric. 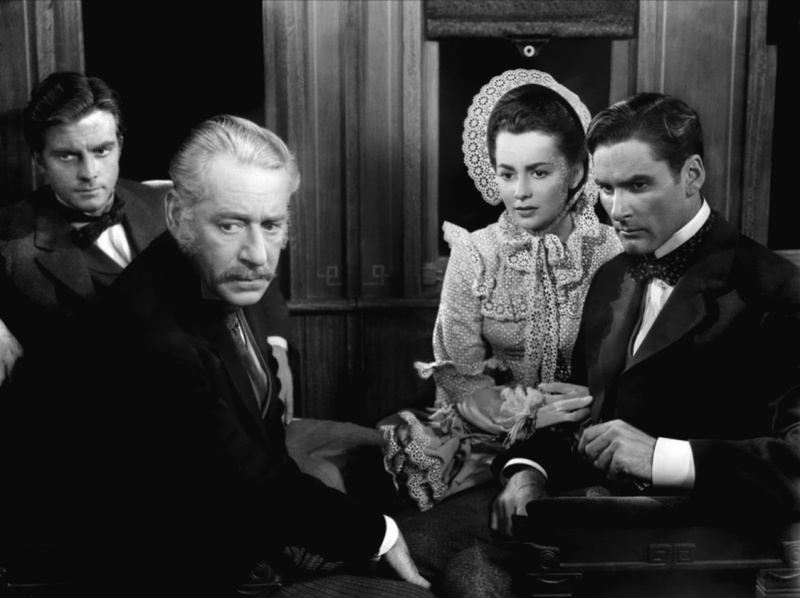 There’s also a girl, Kit (damp-eyed Olivia de Havilland) that both Stuart and Custer are sweet on. Flynn plays Stuart with his usual breezy style. Of course he takes the side of slavers: they’re fellow Southern aristocratic gentlemen. “The South will settle it, in its own time and in its own way.” When he bothers to think about it, he justifies the institution, and he probably imagines that blacks are simple children that need guidance. He feels that slavery will be stopped eventually, after they hang John Brown: “then the South can settle their own problem without loss of pride of being forced into it by a bunch of fanatics.” That’s a telling line: opposing slavery is in poor taste, like using the wrong fork. Stuart: Ouch! That’s too tight, Mammy. Mammy: Don’t tell me how to do this, boy! I’ve bin wrapping white folks all my life. When they was babies I wrapped one end, and when they growed up and took on too much corn liquor, then I wrapped t’other end. Stuart: So what made you leave home? Mammy: Well, old John Brown says he’s gonna give us freedom, but shuck’ens, if this here Kansas is freedom, then I ain’t got no use for it. No, sir! Man: Me neither. I jes’ wants to get back home to Texas and set til Kingdom come. Custer is presented as morally queasy about John Brown. He doesn’t exactly oppose Brown, but Stuart puts him to rights. Flynn dashes off the following with all the certainty that he would use ordering a drink. “It isn’t our job to decide who’s right and who’s wrong about slavery, any more than it is John Brown’s.” Reagan looks abashed. “I guess you’re right, Jeb. I’m sorry.” End of discussion. There’s another melodramatic and awkwardly staged scene where Stuart and Custer are told by a fortune-teller that a time will come when they will be enemies, which they heartily laugh off. They hang Brown at the end (as they did in real life). He sees his execution as ordained by God and predicts an inevitable bloodshed. “The crimes of this guilty land can never be purged away but with blood.” Only then do some of the characters start to look guilty (except for Flynn: looking at the gallows, he says “he was born for this.”) It surely is guilt on someone’s part to have “John Brown’s Body” playing on the soundtrack at the end. 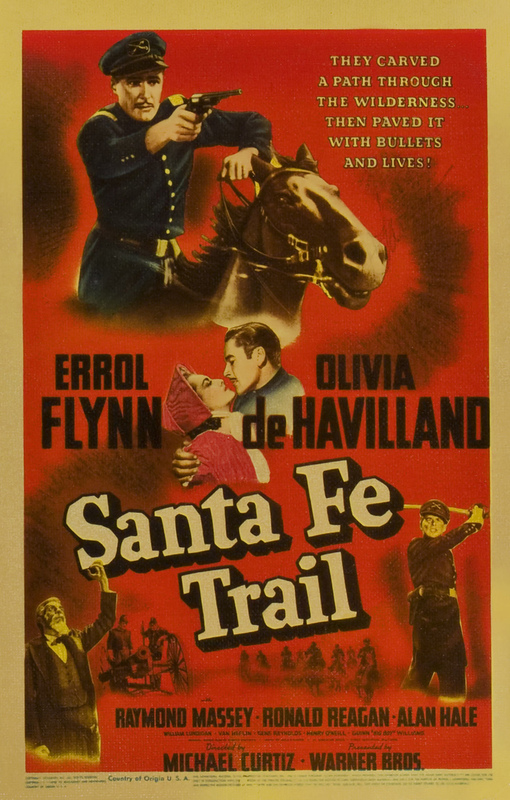 ‘Santa Fe Trail’ is very minor Curtiz, and nowhere near the level of ‘The Adventures of Robin Hood’, ‘The Sea Hawk’ or ‘The Charge of the Light Brigade’ (all of which are equally ludicrous as history, but are infinitely more entertaining.) It doesn’t have much action, and much of the dialogue is stilted. There’s a great score by Max Steiner. The cast is filled out with Warners comic relief: Alan Hale, Ward Bond. I can’t tell you who play any of the slaves, as they are uncredited, which should tell you a lot about Hollywood in the Golden Age. Next Post The best British director of all time? I am a big fan of Olivia de Havilland. Fascinating choice to write about. For some filmmakers, story takes shotgun over history no matter the cost. well i think it’s apt that we should be talking about two Michael Curtiz films on the same day …. I don’t know how many films de haviland and flynn were paired in, quite a few, I think. Bette Davis always thought he was a lightweight actor, but de haviland tells a story that some time in the late 50s she and davis were watching one of their old films, and Davis agreed that Flynn had more talent than she had given him credit for. I think we have to consider that this played to an audience in a country where racial intolerance, and poor treatment of Black citizens was still very much the norm at the time (and for a good 25 years afterwards too). Only 75 years after the end of the Civil War, with the KKK still rampant in the South, I have no doubt that there were all sorts of undercurrents running through the story. With the benefit of hindsight, history, and better education, we can plainly see it for what it was. However, with the same disregard shown for Native Americans in hundreds of cowboy films, it was simple action fodder for the huge audiences, and probably seen as little more, by those enjoying a night out at the cinema. I like this slightly obscure choice for your review Niall, and enjoyed the article immensely. oh, absolutely, there’s no question that the film should be seen in the context of the times it was made in. I really liked this one Niall. Yes, by tomorrow night I will have that one up. I look forward to its response. I like the obscure ones!